The Board of Trustees cannot provide teaching for students during the upcoming strike. 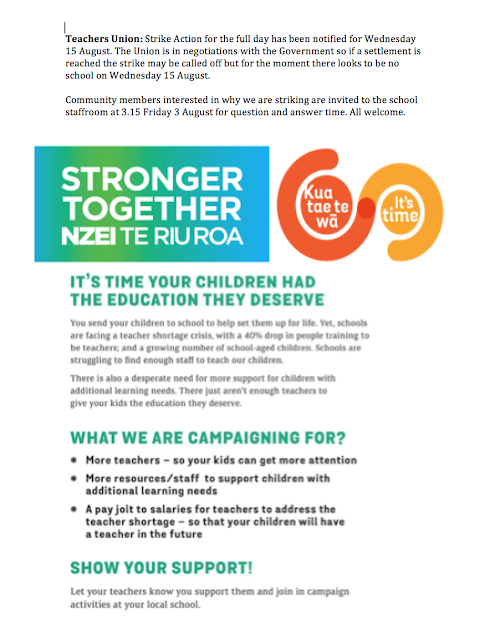 The NZEI has advised the Ashburton Netherby Board of Trustees that the principal and teachers at our school will be taking strike action from 7:00am to 7:00pm on Wednesday 15 August 2018. Community members interested in why we are striking are invited to the school staffroom at 3.15 Friday 3 August for question and answer time. All welcome.